If you’re one of the many people who are confused about how to put money away towards retirement we want to make it easy for you to understand not only how much you’re saving but also how to withdraw from a retirement fund or pass it down without taxes and penalties eating away at your money. First, we’re going to go over what each of the three main retirement products are, how they can benefit you, and the order in which they may you serve you best. Also remember that just as important as these plans are, they will not replace the need for life insurance, which is also a flexible product. It too can be used as a savings on someone else’s behalf in addition to taking care of debts and final expenses. If you need to be paired up with a trustworthy life insurance agent, who may be able to advise you even further about your retirement and savings plans, visit here. You may have started a job and have all sorts of paperwork to fill out about a 401K, a traditional IRA and a Roth IRA. You may or may not be familiar with these types of retirement accounts. You may have always opted out of them so you’d have more in your pocket. However, you should remember that you’re not only saving money when you elect to open up these accounts, but you’re saving hundreds if not thousands in taxes. These types of accounts withdraw money from your employer’s account pre-taxes so you don’t pay taxes on that amount as earned income. Never turn down a matching 401K plan unless you will starve to death because of the deduction from your paychecks. How often do you have people paying you to put money away for the future while getting a tax break on that amount? Any match is free money so don’t pass it up. If your employer is not matching the money you put in your account, you may want to consider an IRA instead. You can still pay into the 401K if you don’t want to be taxed on any portion of your income. It’s suggested that you only do this, however, after maxing out your IRA and Roth IRA accounts. Read on to understand more fully. A common 401K contribution by an employer is any matching %, sometimes as high as 100%, up to the first 6% of your income. This could be broken down, too, i.e. matching 100% for the first 4% and matching 50% for the remaining 2%. There are many variations on this out there so check your employee handbook or speak with someone in human resources to be certain of your company’s arrangement. In 2019, the maximum 401K contribution amount was $19,000 for people less than 50 years old; $25,000 for people age 50 and over. What about an IRA you ask? By all means, if you have enough income that you can max out your 401K and still put money in an IRA do it! If not, pay into your 401K for the matching limit and then place the remainder that you’ve decided you can put away into an IRA. However, it’s not that simple. There are two IRAs, a traditional IRA and a Roth IRA. Let us explain how this works. 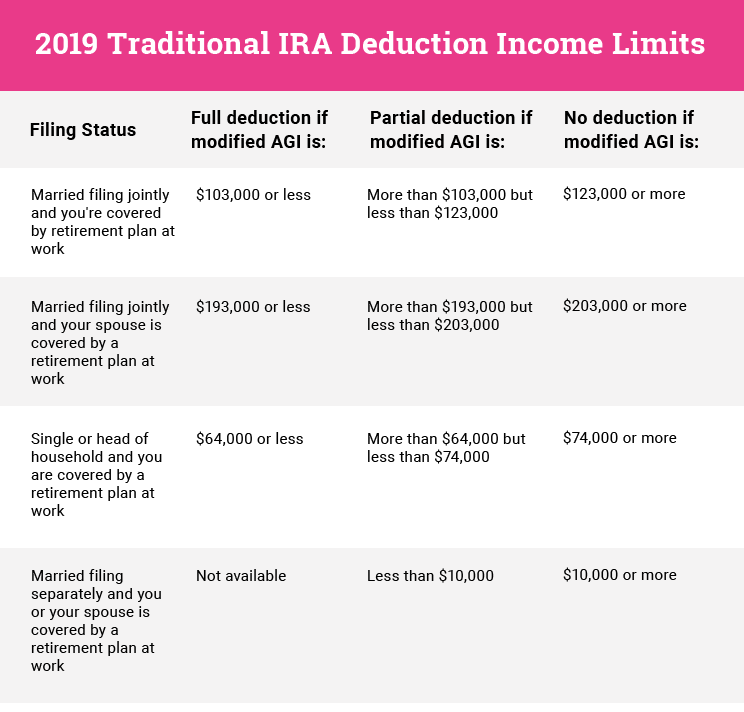 An IRA may save you thousands of dollars in tax deductions but even more importantly, it will allow you to invest for the future, i.e your retirement. A traditional IRA is usually preferred for people who want an upfront tax break. Contributions are deducted from your income unless you have a 401K plan. If you have a 401K, your deductions may be reduced or eliminated based on income. For instance, if you are under age 50, single and made $64,000 or less in 2019, your contribution limit is $6,000. You can’t put away more than $6,000 of your income into the IRA. If you made $65,000-73,000 you get a partial deduction. If you made over $74,000 or more you get no deductions. It’s interesting to note that you can contribute on behalf of someone (a grandchild, for instance) but there is a limit to the contribution, usually the earned income amount of the account holder (the grandchild). So, if that grandchild made $3,500 in 2018, he can contribute that money to his IRA without exceeding limits or someone else (grandma) can contribute that amount on his behalf. Also, there is such a thing as Spousal IRA, which often applies to a non-working spouse. The working spouse can contribute on behalf of a non-working spouse, who does not have an earned income. However, for the non-working spouse to be eligible, the working spouse must make an income that matches or exceeds the total of both contributions. Basically, you can’t put away more than you earn in a given year. It doesn’t matter what you made the year before. You can also consider a Roth IRA, which has the opposite benefit: You won’t get a tax deduction by contributing but you will be able to withdraw money in retirement, tax-free. 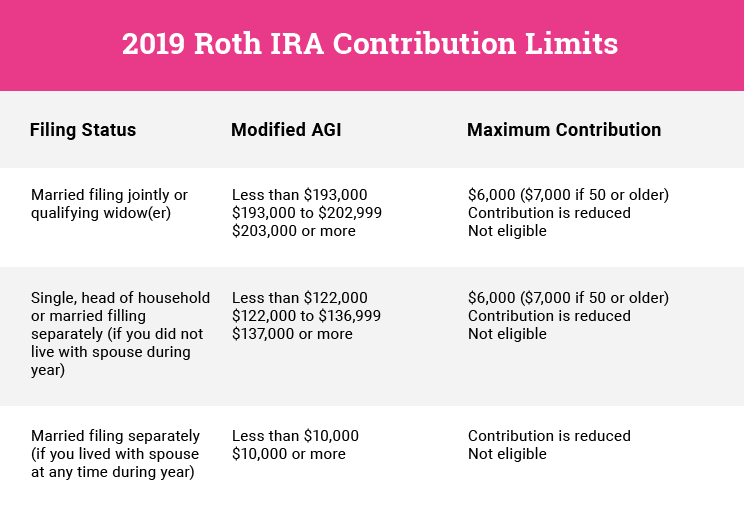 Keep in mind that if you withdraw money from both an IRA and Roth IRA before age 59, you’ll pay taxes and a 10% early distribution penalty fee. There are exceptions for penalty free withdrawals, like paying for college or a first home, but you will be taxed. To speak more in depth with a life agent about life insurance, 401K plans and IRA/Roth IRA accounts, visit here. Why Would I Contribute if I Can’t Deduct? You’re still saving, and if you’re like most people, you’ll have it put aside before you see it and therefore it’ll stay in that account (unlike the savings account you keep using for false emergencies). Not only is it a savings, it’s a tax-deferred savings. This is a tax-free retirement account that offers growth on your investments. Unlike a traditional IRA not everyone is qualified. Your contributions to a Roth IRA aren’t tax deductible. What this means is that the income you put away doesn’t get the tax break now, but you will not be taxed when you withdraw the money in retirement. Compare this with a traditional IRA where your withdrawals are taxed as income. When you open your account, you can choose how much risk you want the investments the account holds to have. For instance, you can choose mutual funds, stocks, bonds and exchange-traded funds (ETFs). Unlike a traditional IRA, you can use a Roth Ira to pass down money to beneficiaries or heirs. You’ve already paid taxes on your Roth IRA contributions, so you can take out money without taxes or a penalty at any time. You will, however, be taxed/penalized if you withdraw the investment earnings. You can even begin deducting (tax free) at age 59.5 after having held the account for a minimum of 5 years. In 2019, the maximum contribution was $6,000 per year or $7,000 at age 50 or more. Contributions can be made in conjunction with the 401K. You can use a Roth IRA fund to pay for college expenses without an early distribution penalty (much like a 529 plan). You may still have to pay taxes, however. The downside of a Roth IRA is that there is an income cap. In 2019 for a single person making less than $122,000, the contribution limit is $6,000. There is a reduction if that person makes $122,000-136,999 and they are not eligible if they earn more than $137,000. There are also ways to turn your traditional IRA into a Roth IRA to bypass income limits, but we’ll let you take care of that with a financial advisor. Remember that many life insurance agents have the experience and know-how to act as your financial advisor. If you want to be paired with such an agent, visit this page.